Desserts and muffins are a treat for everyone. If you want to lose body fat, a muffin bread snack is not a good for a healthy weight loss diet. Muffin bread has lots of calories. In addition to energy content, a nutritious diet helps the body to burn calories faster and maintains a healthy metabolic rate. So try calorie-counting, and looking out for a nutritional value. So this is it: muffins are not very good idea if you are on diet. Each sugar-full muffin has close to 500 calories. These muffins are often sold in most bakeries today and are just like a big bad tasty chocolate cake. But made on certain way, it can become a true nutritional treat. If the home made muffin has protein and calcium, out of non-fat milk or low fat yogurt, anti-oxidants and fiber and complex carbohydrates made out a whole-wheat flour, rolled oats and cornmeal, it is certain that this muffin is a diet proper low fat, a wonderful calorie birthday cake. It is simple to make these: Mix the flour and other dry ingredients together. In other bowl, mix together the wet ingredients. The liquid mixture put into the well, and mixes with a wooden spoon. Too much mixing activates the gluten in the flour and make muffin harder. A smaller muffin takes only 12 minutes. In other bowl mix baking soda, salt, cornmeal, flour, sugar, baking powder, and cayenne pepper. Mix thoroughly. Then in other bowl mix egg whites, milk, and oil and stir in chillies, corn or cheese .The liquid mix with dry ingredients and stir until it blends. Put the 1 tablespoon batter into a muffin cups and bake 12 minutes. Cool it down in pan. One mini muffin like that has 140 calories, 1 mg iron, 2 g fiber, 98 mg calcium,.308 mg sodium, 13% fat (2 g; <1 g saturated), 75% carbs (26 g) and 12% protein (4 g). 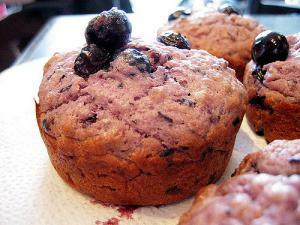 There is a way to cut down the fat and increase the fiber with commercial muffin mix. It is possible to use a canola or olive oil, instead regular one and to put 1 tablespoon of oil into a mix. Just one spoon has 186 calories and 21 grams of fat and that is just20 grams saturated. Also, using egg whites, not whole eggs are replacing 2 egg whites for each egg and that is 42 calories and 5 grams of fat less. Reduced in fat milk products trade ordinary milk, that way to cut down 64 calories and 8 grams of fat. Taking non fat milk or yogurt means 7 grams of fat per cup. If you prepare fresh or frozen fruit just 1 cup of fruit per box of mix is enough. My food creations:P are they healthy?